You end up spending about one-third of your life in the bedroom sleeping – that is a huge portion of your life! The bedroom is where you relax, rest and allow your body to recharge, helping shape how you feel during all of your waking hours. But many people ignore the bedroom and the quality of time they spend in it when it comes to home design. Sure, it’s important to outfit the rooms that your guests see first, like the kitchen, living room and family room, but neglecting the bedroom is only doing yourself a huge disservice! From the bedding you choose to the other décor options in your house, it’s important to make sure your bedroom is in great shape to help you get a good night’s sleep. Here are some tips to help you whip yours into shape. First things first – make sure that you have a comfortable mattress and bedding. You can find some great options in Macy’s bedding. Look for hypoallergenic sheets that won’t disrupt the quality of your sleep and big, comfy pillows that will provide a wonderful oasis for you to rest your head on at the end of a long day. You can choose a down comforter for extra cushiness or a thin cotton one for those warm summer nights. It’s also a good idea to get a mattress pad to protect your mattress over the years. Natural light is a wonderful thing for any room in the home, but when it comes to your bedroom, you want to make sure you can keep the sunlight out of your eyes until you’re ready to wake up! Make sure that you have proper curtains that block the morning rays while you snooze – this will help keep your body in tune for the day to come. You can also choose attractive window covers that add to the overall design of your bedroom. Your bedroom should be the one room in the house that is dedicated to sleep – and that means getting rid of electronics like laptops, phones and TVs that emit a lot of light and can put you in a tense, alert state when you’re trying to get rest. Decorate your room with wall hangings, pretty rugs and other decorative objects instead of having a TV or computer. You can always read by lamplight until you’re feeling sleepy – this is a much more natural way to let your body wind down. Little noises in the night can wake us up much more frequently than we realize. Car horns, barking dogs, neighbors coming and going – all of these sounds can disrupt our sleep and leave us feeling groggy and unrested in the morning. One of the best ways to combat nightly noises is to use a white noise machine – Homedics makes a great Sound Spa that produces a variety of soothing noises that can help you fall asleep and stay sleeping soundly through the night. 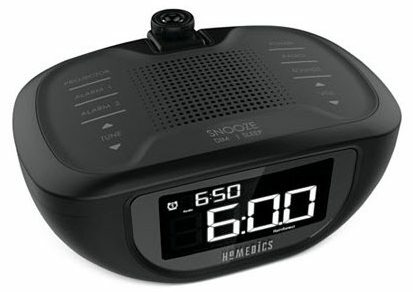 Plus they double as an alarm clock, so you’ll have no trouble getting up on time in the morning! These simple tips will help you get the best possible night of sleep so you feel fantastic in the morning!